Pablo Picasso, "Gentilhomme et Maja," 1968, drypoint and aquatint on paper, 4 3/4 x 2 3/8"
Pablo Picasso is a name practically synonymous with the word art, and the artist himself a defining character in art history. Given the artist’s astounding variety of styles and mediums, tucked in two of the smaller rooms in the large gallery space is a surprisingly intimate collection of Picasso’s prints. Not only does the space itself feel cozy, providing a more personal and casual interaction with the work, but the subject matter too relates closely to Picasso’s life, featuring many of his lovers and relationships, as well as an inward perspective on the artist own conflicting personal qualities. One of the earliest prints, “Salomé” (1905) is one of a series of intaglios depicting street performers. The figures are set against a starkly blank background, yet their movement and composition create a dreamlike tableau. 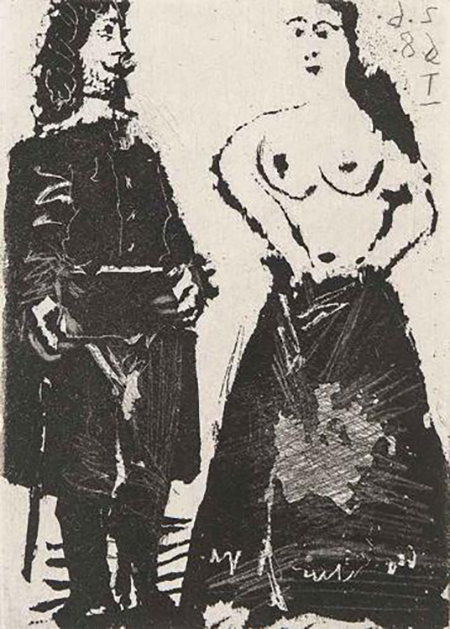 Two of the latest are sugar-lift aquatint prints, “Gentilhomme Et Maja” and “La Sérénade” (1968) feature two lovers from Spanish literature and Picasso’s less refined, more experimental style of figurative work. Some of the most elegant pieces in the exhibition span the 1930s, where Picasso’s superb use of line and simple forms merge seamlessly with denser and more expressive etching. A great example of this is “Modèle, Tableau et Sculpture” (1933), which was likely inspired by the myth of Pygmalion. “Tête de Femme No. 7. Portrait de Dora Maar” (1939) also highlights Picasso’s brilliant use of line and shape, while incorporating his signature fragmented style. Also one of the few etchings in the collection to incorporate color, the piece depicts Picasso’s lover, surrealist photographer Dora Maar. It’s a captivating example, like others in this collection, of Picasso’s ability to interpret intimacy, even and perhaps especially, in his most reductive and experimental works.